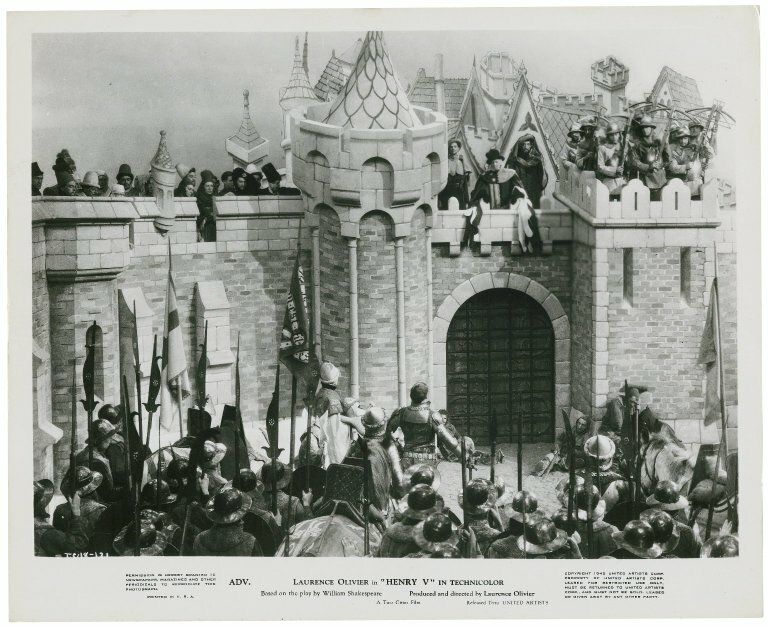 Photograph from the movie of Henry V by Laurence Olivier : At the gates of Harfleur. 1945. ART File O49.3-H1 no.23 PHOTO. Folger Shakespeare Library. Laurence Olivier’s directorial debut, his film adaptation of Shakespeare’s Henry V during World War II, was only the third Shakespeare film ever to receive recognition at the Academy Awards, after A Midsummer Night’s Dream (1935) and Romeo and Juliet (1936). It’s worth noting that Henry V wasn’t Olivier’s only Oscar-nominated Shakespeare movie; he also directed and starred in Hamlet (1948), which did even better with its awards count. It won the Oscars for Best Picture (the first non-American film to do so), Best Actor in a Leading Role, Best Art Direction-Set Decoration, Black-and-White, and Best Costume Design, Black-and-White. It was also nominated for Best Actress in a Supporting Role, Best Director, and Best Music, Scoring of a Dramatic or Comedy Picture. This Oscars season, we revisit a Shakespeare Unlimited podcast episode about Shakespeare on film, featuring Samuel Crowl, professor of English at Ohio University. He’s also the author of A Norton Guide to Shakespeare and Film, Shakespeare at the Cineplex, and Shakespeare Observed. He was interviewed by Rebecca Sheir. Below is an excerpt from their conversation about Laurence Olivier and Henry V.
SHEIR: You’ve said that it really took Laurence Olivier to break that code, to crack that code of how to successfully do Shakespeare on the screen. What do you find different in his version of Shakespeare versus what Hollywood was doing? CROWL: Well, for one thing, as you know if you’ve seen the film, it all starts in the Globe theater. CROWL: And it uses many different forms of representation. So we start in the theater, and then we move out from the theater, not into location shooting, but into representational sets. And then we move from those representational sets, finally, at the Battle of Agincourt, into on-location landscape shooting. So he begins to play with cinema the way Shakespeare plays with theater, and while Shakespeare is always willing to be meta-theatric, Olivier is being meta-cinematic here. CROWL: And the film comes out at a time, and is bright, and he made it in Technicolor, because he wants to make a film that is a present to the English at this moment, and it was. So I think the cultural moment is important here, too, because it was a film that said Shakespeare and the Elizabethan Age is part of what we’re fighting for.